If you couldn’t tell by the plethora of pesce posting (needed some italian for that alliteration), I love cooking with seafood. Particularly in the summer, when light and refreshing dishes are a must, there is nothing better than fish and shellfish. But all that aside, sometimes all I want is a medium rare piece of beef! I had been craving a steak for a few days and had been thinking of accompaniments to keep the dish summer appropriate. That watermelon salsa I had made last week had come to mind but a simple repeat would not suffice. This time I added some fresh raw corn because while everyone has been obsessing on tomatoes, there’s been some pretty awesome corn this year as well! 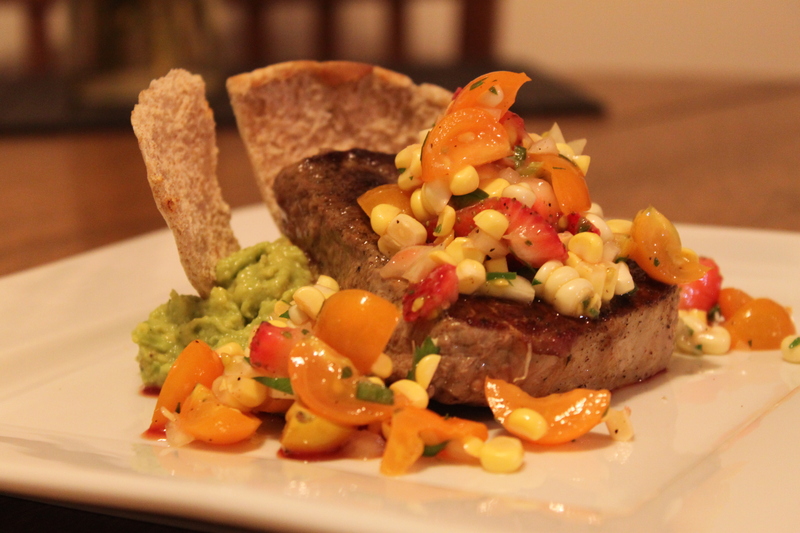 With a little heat from a serrano chile, this salsa went great with this seared to perfection steak. I’ve been trying my best to purchase the local grass fed beef whenever possible. For a multitude of reasons I buy into the quality that is being offered and quite frankly if you are careful, the best cuts shouldn’t cost you too much more than the alternative. The one caveat to grass fed beef is that it’s much closer to game meat in terms of the fat content. Typically the grass fed cattle are leaner which means cooking their offerings requires a bit of attention. If you are not a medium rare meat eater, grass fed may not be for you. But back to the dish! With a bit of smashed avocado and some quickly toasted pita, this meal definitely did the trick. Craving officially squashed!